The future of wine packaging is rather positive, according to Euromonitor International research. By 2018, global retail demand is set to rise by a 2% CAGR to reach 29 billion units. Yet it is also going through rather revealing changes. While glass bottles are finding a new lease of life among developing regions, the ‘Old World’ is making way for alternative packaging to glass, with PET bottles and bag in box making wine particularly suitable for less conventional consumption occasions, such as on-the-go and the outdoors. Demand for wine packaging is on the rise, globally. Over 2013, retail volume sales of wine packaging grew by a 1% CAGR to 26 billion units. Wine packaging also remains rather concentrated in format, with still light grape wine and the ubiquitous 750ml glass bottle with a cork representing the bulk of volumes. Red, white and rosé wine together hold a share of 70% of global packaging volume (83% for glass packaging); characteristics which come to a great extent from the traditions of wine production and consumption in the Old World. Western Europe still accounts for 41% of global wine packaging sales in 2013. This homogeneity in the market for wine packaging and closures is not expected to change in any drastic manner through to 2018; yet there are some areas of diversification in evidence. 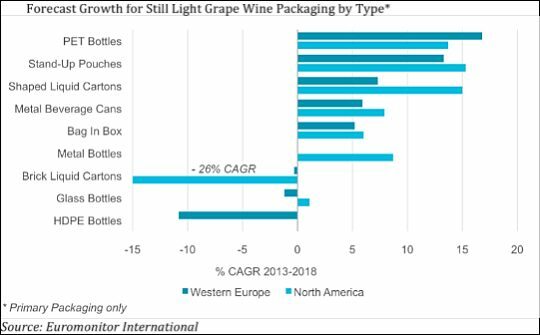 Non-grape wine is globally much smaller than grape wine in packaging volume terms, with an 18% share of wine packaging demand, as its consumption tends to be more specific to certain Asian countries. Although glass bottles are also standard for non-grape wine alongside ceramic varieties, the most common bottle size is the smaller 500ml, and PET bottles are also much more widely used as a packaging alternative. Both the smaller format and the choice of PET for certain products generally answer a need for these products to remain affordable to a wide range of income-earners, including those in rural areas. Ahead of Japan and South Korea, the Chinese are by far the biggest consumers of non-grape wine and will drive almost the whole of packaging’s unit volume increase to 2018 in this category. In the near future, wine packaging will find the bulk of its global growth potential in Asia Pacific. The region will, over 2013-2018, generate some 1.9 billion additional units. Western Europe is experiencing a mild decline, due to high maturity levels and ongoing expenditure restraint amongst many consumers in the wake of the 2008 economic crisis. Meanwhile, Asian consumers are warming to still light grape wine consumption, seduced by a certain perception of the product as being sophisticated. In China, by far the most promising country for still wine packaging, red wine is perceived as having health benefits and appeals to consumers for this reason. Brazil and Argentina are other key countries for future growth, fuelled by a growing middle class, and also marketing campaigns run by major importers such as Expand Importadora and Interfood Importação, aiming to promote the culture of wine drinking in the case of Brazil. It is the sense of sophistication and the etiquette around wine drinking that will enable the 750ml glass bottle to continue its unrivalled ascent for still light grape wine in emerging countries. This is also why, despite the metal screw closure seeing the biggest growth as a closure type globally, the more traditional cork will take the lead in newer wine territories such as Asia. This is not to say that wine packaging’s future is only dictated by the emerging world. 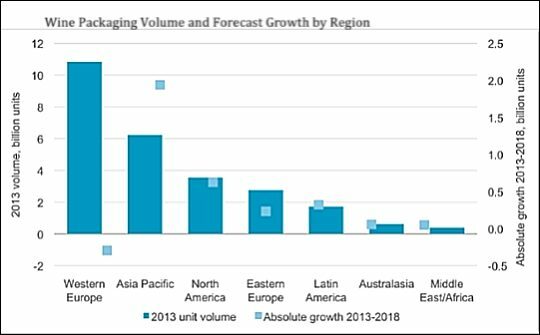 In fact the US will yield the second biggest volume growth globally between 2013 and 2018, with 555 million additional units. In mature countries, however, the market for wine continues to change along with tougher economic conditions and new consumer behaviour. A number of wine producers are choosing to introduce their products in a lighter, alternative packaging to the glass bottle. Most initiatives help reduce operational costs, especially for exports, but are also shaking the ground principles of wine drinking in the Old World and thereby offering alternative ways of consuming wine to the traditional meal time at home. A number of packaging alternatives to glass make it easier for wine to be consumed outdoors or on the move. This trend will primarily benefit PET bottles which, aside from positioning certain products as economy or for cooking, are also increasingly being released in single-serve sizes of 187ml and 250ml, to be consumed for a quick lunch away from home and at festivals/events. 187ml PET bottles are expected to be particularly successful in North America in the foreseeable future, where this type of convenience appeals. At the same time, the bag in box will win more enthusiasts, especially in Western Europe, where its value for money is a key selling point. Bag in box packaging has already made good headway in France for everyday consumption around dinner time, with large formats such as three and five litres allowing for the product to be used up over the course of a few weeks. It is also set to see good growth in the US, Germany and Italy, being favoured at times for social gatherings and the outdoors. With the idea of following in the footsteps of the bag in box, the stand-up pouch remains niche in wine but is expected to become more noticeable in countries such as France and the UK. These alternative pack types are of course not deemed suitable for cellar wine. The glass bottle retains its privileged role for wines to age, as a container which is allegedly neutral to its content. Glass may nevertheless need to further respond to these packaging changes, following existing incentives towards lightweight bottles, such as seen in Canada in 2013.